Now you can add more happiness and charm by gifting a nice personalized key chain from MyFlowerTree. Gifting this particular gift item will definitely make your loved one realize about your true love and affection for them. We all know the fact that exchanging gifts is a part and parcel of our day to day lives. There are so many festive occasions in our country and in some of the occasions; gifts play a very crucial role. There’s no room for doubt that gifts have become an integral part of our culture. 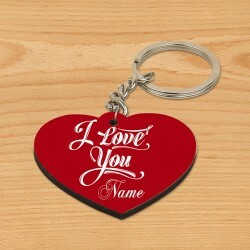 Special gifts like personalized keychains can express the emotions of care, affection, love, gratitude and other feelings that are left unsaid. 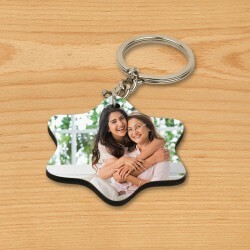 When it comes to pampering your beloved one by gifting something really unique and special, opting for the personalized keychains online offered by MyFlowerTree could be a great idea. Always remember one thing that unique gifts like personalized photo keychains are highly cherished by the recipients. We have a large collection of photo and name key chains for you. Each of these key chains comes with an enticing design that can easily impress anyone. The best part of opting for personalized gifts is that it empowers you to put a pure personal touch to the gift. You can easily buy personalized keychains online from MyFlowerTree and the gift will be delivered to the doorstep of your dear ones. If you want to make your gift more heart touching you can add a delectable cake or floral arrangement with this gift. MyFlowerTree has been dominating the market of gifting for a long time and the best in class delivery feature that our online store offers is one of the most crucial reasons behind it. Now, what are you waiting for? Just buy personalized keychains online from our store and make the bond of love and affection with your beloved one stronger than ever. Products in this category have been rated 4.7 out of 5 based on 100 reviews.